Edmund's dev blog for gay nerds: Meat Boy plush! You can now order your own Meat Boy plush from my store! Meat Boy is hand made by the eternally awesome Danielle White, dimension wise hes about 4 by 4 inches and sells for 15 bucks. the 1st 15 come with hand made meat boy buttons! wooooo!. Speaking of plush, i should take the opportunity to plug the designer of all the plush toys in my shop, my lovely partner in crime Danielleorama. Aside from making awesome plush versions of my work she also has her own handmade toy line and recently got a very nice chunk of press i feel is worth mentioning, Check it out here. 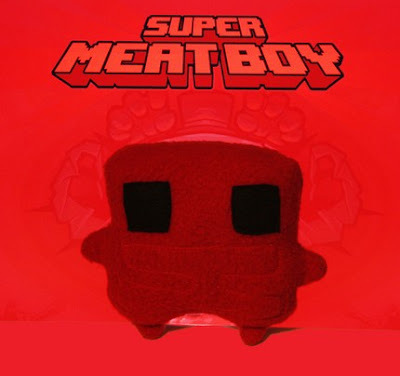 im still debating on if i should post my meat boy updates here or just on the meat boy blog... but ill be posting the 1st title track off Super Meat Boy tomorrow later in the day. Again we will be using the great Danny B for music and hes been working on some epic remixes of some of the more memorable tracks in the flash version.